This weekend was a productive weekend for me. I finished the book I was reading, which I’ll leave a review on shortly, and am really looking forward to starting Turn Right at Machu Picchu: Rediscovering the Lost City One Step at a Time by Mark Adams. More importantly I took my first swing at writing Flash Fiction. After completing a first draft on Friday, and four combined revisions over Saturday and today, I think it’s in its final state. It’s of the fantasy genre and comes in just above one thousand words at 1065, which I know may need to be trimmed down depending on where I decide to submit it. That’s where I need help. If anyone has any good resources or online mags that they’d suggest I take a look at, I’d really appreciate the advice. I’d like to compile everything onto a single page here. I found one of interest to begin – Flash Fiction Online. It’s an online quarterly recognized as a professional publication by the Science Fictions Writers of America. I bought my wife a Kindle Fire for Christmas and as a result ended up with her old Kindle. While the majority of my reading will still be of physical books, I’ve been impressed with the Kindle’s convenience. As such, I’ve been looking into uses for it beyond reading a normal novel, specifically the availability of short stories on it. Unfortunately, it is a good news and bad news scenario. The good news is that there seems to be a growing amount of short fiction on the Kindle, a ton of it actually. For those serious writers out there, the bad news is that there also seems to be a large amount of free fiction as well, both short fiction and novel length. With the increasingly prevalent impact that technology is having on the publishing industry, I’ve often wondered what impact it would eventually have on those writers who earn their living through their craft. I have to believe that the increasing amount of material made available by hobby writers, many times for free or as good as free, is hurting that side of the industry. If nothing else, the pure saturation of material will likely become overwhelming. From what I’ve seen on various blogs and magazines, it’s a very hotly debated question – should someone offer their material for free so that they get exposure and readership? I’m a strong supporter of the writing community, from the closet writer without a finished story to his name to those admired few who have the talent and fortitude to make a living at it, be it modest or extraordinary. However, it scares me to see the results when I do a search for ‘short stories’ in the Kindle Store and then narrow it down to Fantasy Kindle ebooks. Eleven of the twelve items displayed on the first screen are all free. That question may never have a final answer just because each person’s scenario is different. Some people do need to use the opportunity and impact of a free short story as a lead-in for their additional work. However, the question I haven’t seen posed anywhere though is – How much is the hobby writer adversely impacting those writers who use the Amazon fees to pay their bills? I’d love to hear thoughts and comments on this. In today’s world where we are bombarded by mind-numbing reality shows, more online interactions than real-world, and an overall increase in social awkwardness, it is becoming more and more obvious that we’re too concerned with the lives of others instead of our own. I’m going to assume that anyone reading this may at least be a little more introspective than the general population, so it will be interesting to hear your thoughts. I grew up in a somewhat sheltered world – class of 151, same group of friends throughout high school, captain of this, involved in that… yada yada yada. I never really paid attention to current events. I definitely didn’t know what was going on outside of my town and most times not what was going on within. Thank goodness it was before the Facebook phenomenon or who knows how I would have turned out. Several life events, marked by some emotional scarring, were monumental in changing my view of the world. However, outside of that, I fully think there’s one element that helped me the most and tends to separate people; I took more than just an entry-level English Lit class. What other classes involve such in-depth character analysis and require a person to ask the ultimate question – Why? You don’t see many business classes reviewing the lifestyle of or reasons why Rod Blagojevich thought he could get away with selling a Senate seat. Analysis into a character’s motivations can become habitual is easily transferred into real life situations. During my two years of various Literature classes, all elective and not even enough to qualify as a minor, I learned to ask myself ‘why’ which in turn allowed me to have a better understanding, not only why others may do what they do, but eventually to turn it internal and ask why I do some of the things I do. Getting to know myself has been more enlightening than you can imagine. To be fair, it hasn’t been easy. I found myself making excuses, both for myself and for those who influenced me early in life. And many of the truths were hard to absorb. But I’m very happy to have started down that path of discovery, a path that will likely take me on a lifelong journey. I’ll start this by saying that I’m not a huge fan of Anthony Bourdain‘s, but in this instance I’m fully on board with him. For those of you who somehow haven’t heard – Paula Deen announced that she has had Type 2 diabetes for three years. During this time her celebrity status across the U.S. has grown tremendously, almost entirely due to her butter and sugar laden “southern style” cooking. In an amazing coincidence this announcement came out at the same time that Paula announced she would be taking a new role as spokeswoman for Novo Nordisk, a maker of diabetes medications. How fortuitous for her. Anthony Bourdain later tweeted, “Thinking of getting into the leg-breaking business, so I can profitably sell crutches later.” I couldn’t have said it better. Paula Deen should also announce that she’s decided to run as the face, or parts less friendly, of Capitalism and greed. I am not one to cry victim for the public, especially not when it comes to a situation like this where anyone who followed Deen’s lead was making extremely obvious poor decisions. Moderation in a country of extremes is obviously a whole other battle. However, nothing boils my blood more than someone who sees extreme profits at the expense, and possibly the health, of those who may not know any better. This past weekend I hosted a guy’s night where four friends and I got together, played cards, shared unfortunate humor, and had an altogether great night. I had time to reflect today, during my 4+ hours in the car, and really feel fortunate for the friends I do have. The four I had over consisted of three I’ve known since middle school and one that I just met a couple of years ago. This was basically his first introduction to the other three. It still amazes me how we can all get together, after having not seen each other for months, and pick up right where we left off. The jokes are still there. Faces have grown a little older, and yes hair lines may have thinned a bit, but the spirit and personalities still persist. And the great thing is that I think the newest addition is going to fit right in as well. Isn’t it amazing how the bonds formed in youth can many times be so much stronger than those we form as adults? When we’re young, we share experiences so easily – the types of experiences that tie one to another even if you’re apart for years. And as adults, many times we find ourselves in the flowing river of monotony to the point that we don’t really even know the people around us. When was the last time you just randomly stopped by someone’s house to say hello? Did you feel like you were intruding? When exactly did I become too old to do that? It must have been somewhere in my early 20’s. Is technology to blame or is it just simply that we don’t get to know people as well as we used to? This all goes toward one of my 2012 resolutions, to make two good friends this year. I hope everyone out there can do the same. I did a little free-write last night and here’s the result. I won’t tell you my motivation but would be very interested in hearing your thoughts. It’s been years since I’ve attempted something like this. Common in all but chance. Heads the floor of the dance. The brute no less a mule. I finally finished reading The Color of Magic this week, which is actually the third time I’ve read it. It’s been at least 10 years since the last time and it was almost like reading again for the first time. 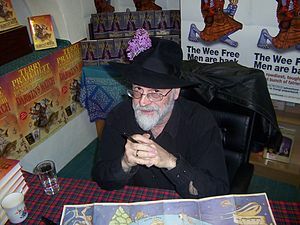 The Color of Magic is the first of Terry Pratchett‘s novels set in a fantasy realm called Discworld. 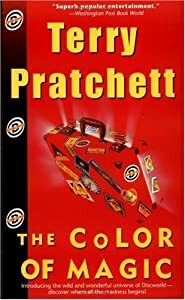 The story follows two main characters – Rincewind, a wizard of sorts, and Twoflower, a visitor to the city, Ahnk-Morpork. They have several adventures and meet many fantastic characters and creatures throughout the book, including thieves, warriors, dragons, and even Death. The book is separated into four short but linked stories that could stand alone, but do flow one into the next. When I first set foot in Discworld, I was probably around 12 years old. At that time, Terry Pratchett spun a tale of whimsy and happiness. I took note of those things a normal 12-year-old would, the escape into an alternate reality that was clearly more exciting than our own. The second time in was just a few years later and not much had changed, although I do remember finding it much more comical than before. The interactions between Death and Rincewind are great. This time is took me much longer to read it than ever before. It wasn’t that I didn’t enjoy it as much as previously, because I did. It was because I spent about half the time reading and the other half thinking about a passage in the book. Pratchett touches on politics, religion, and common misconceptions. There is so much depth in his writing, so much philosophy and satire, that I completely missed previously. Pratchett obviously has a great sense of humor but within that humor lies deep contemplation and intelligence. If anyone else has read it, I’d be very interested to hear your thoughts and reactions to it too. If anyone is looking for an interesting way to start the creative juices you should take a look at the website oneword.com. It’s a simple idea. You have 60 seconds to write about a single word that you’re presented with. Then, once time is up, your entry is posted right along everyone else’s. The 60 seconds spent helped break the ice and it was really interesting to read everyone else’s interpretation of the same word.